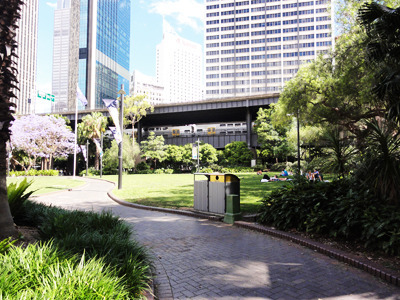 First Fleet Park is the name of the lush green lawns that sit between the Museum of Contemporary Art and Circular Quay. 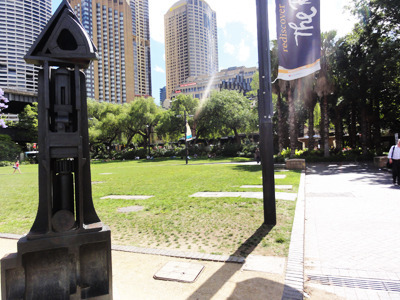 The park is named after the First Fleet, the Europeans who landed in Australia in 1788. While it sits in the historical are of Sydney, the Rocks, you won't be thinking much of history when you're there. Instead First Fleet Park makes a lovely place to relax and picnic. 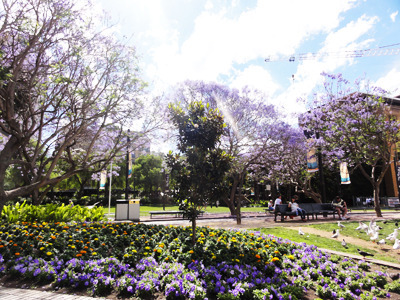 The park is a beautiful place to sit thanks to the bright and colourful flower beds, and the purple jacarandas that help give shade and colour to the park. You can find a tree to sit in the shade of, or a bench to sit and watch the harbour. As this is such a busy area, First Fleet Park can be the perfect place for people watching. From the tourists studying their maps, to the people feeding the seagulls, there are always interesting characters to see. When the sun is shining First Fleet Park is a popular place to sit and sunbathe. It isn't uncommon to see people sprawled out in the sun, soaking up the rays. Just make sure if you do take a nap in the sun you're covered with lots of sunscreen, because sunburn does not make a fun souvenir. First Fleet Park isn't the best place for playing ball games, or running around, as most people in the park are just taking some time out. Instead think of less intrusive games like hacky sack, or why not relax yourself with a picnic. You can either bring along your own food, or grab something from one of the places around the park and enjoy it on the grass. You'll have some very inquisitive native birds hanging around, but try not to feed them, as it can be harmful. So when you need to take a break from wandering the city, or if you just want a nice park to go to, then First Fleet Park might be the place to go. It is beautiful whether you're sitting around for a few hours or just passing through for a few minutes.